Private label branding is where a line of products or brand is available exclusively to the customers of a specific store or chain of stores, instead of being sold publicly by the manufacturer through many different distributors and retailers. The retailer offering this private label may or may not be the manufacturer. Private label goods are often manufactured by a third-party and merely carry the brand label of the retailer. Manufacturer brands, on the other hand, are made and branded by the manufacturer, and the rest of the supply chain merely distributes it and puts it on the shelf for retail purchase and sale to end users. The history of private labels, as chronicled by the Private Label Management Association (PLMA), goes back to the 19th century when merchants who ordered mail order goods began cutting costs by going straight to manufacturers, or manufacturing it themselves. Now it’s so ubiquitous that anyone with a store can establish a brand, and start selling their own branded goods simply by ordering it in bulk (with branding and packaging) and retailing it in their store and/or online on their website. Cheaper goods and more profits, as compared to selling someone else’s branded goods. Increases customer retention rates and loyalty, since they can’t get the same private label elsewhere. Your own packaging and brand name reduces cost of customer acquisition and marketing. Control over production processes and standards, even if you’re not the manufacturer. Ability to customize products to align with a brand experience that is part of an integrated or omnichannel customer engagement and marketing campaign. Private labels and brands are, by definition, not meant to be publicly known brands that you can buy on any street corner. Even so, some retailers have become so hugely successful in this that the brands have become quite famous. Let’s look at some of these private label branding success stories. Amazon’s private label branding strategy has, like most everything the online retailer does, become a symbol where their brand is more famous than the rest of the industry. 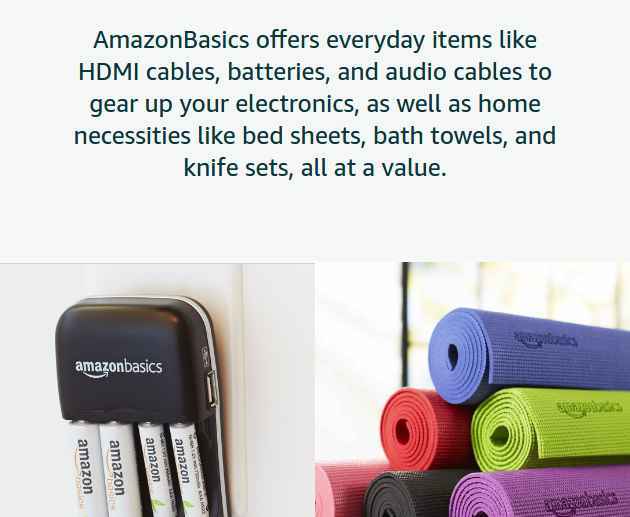 You can get everything from cables and batteries to home use items such as bath towels and sheets and knives. It’s the Amazon branding that makes it such a big hit. The manufacturers may be from anywhere in the world. All they have to do is provide the quality that Amazon demands. The product is warehoused and shipped to customers from Amazon’s own fulfillment centers, so customers don’t have to worry about delivery delays, who the manufacturer is, where it’s going to be made, shipped from, and other such questions. 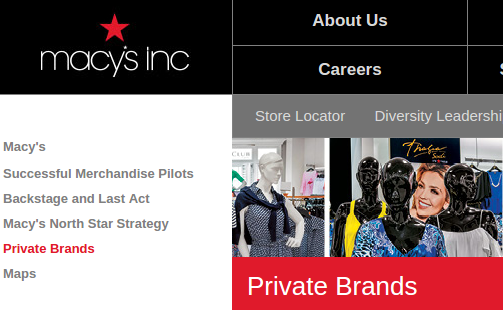 Macy’s private brands and labels. Macy’s has developed what is an ideal niche of customers who appreciate the value of shopping with the store. As such, private brands created by Macy’s only serve to reinforce this perception of exclusivity that is available “Only at Macy’s” and appeal to their lifestyle. The brands created by Macy’s, including Alfani, Bar III, Charter Club, Club Room, First Impressions, Hotel Collection, Ideology, JM Collection, etc. These are brands that are supported by in-store environments and marketing that match the brand’s look and feel, and the core message. Private labels at Macy’s don’t have the marketing and store support, but are simply merchandise with the Macy’s name on them. This includes Karen Scott, The Cellar, Epic Threads, Holiday Lane, and more. Target calls it “The Secret to Enviable Style Without Breaking Your Budget.” These Target owned brands include Market Pantry, Archer farms and Simply Balanced for grocery products; up & up for household commodities; Room Essentials for low-end home goods; and many apparel brands for men, women and children. Again, Target’s private labels and brands are in line with their store’s USP of cheap and affordable products that you cannot find elsewhere. Moreover, you cannot find comparable products in the same price range at other stores. 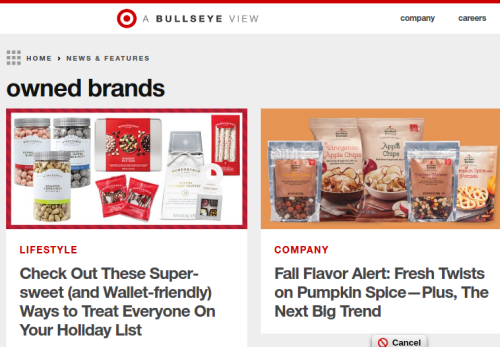 This is what keeps Target’s customers coming back to them, and the main reason that the Owned Brands program at Target has been so successful. What these examples of private label branding success show is that it’s not just about saving costs and earning more profits by creating your own private label or brand to sell in your own stores. It’s also about being able to align the product category in line with your company ethos, and the key differentiator that brings a specific type or niche of customer group to your stores. If you identify this product category and the customers who are attracted to it, then you should be able to make a success story out of a private label that caters to this segment.